Typical breakfast. Lunch was leftover chili and an apple. 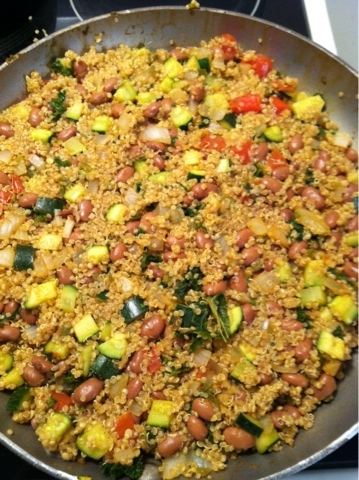 Dinner was a household favorite Quinoa and Beans. Snacks were almonds, a Luna protein bar and oatmeal. Took my usual work walk. I've still been feeling kinda crappy but I wanted to get in a strength day. I went to the gym and did a 5 minute elliptical warm up and then 35 minutes of various strength training. Gotta love that after burn! Still reading the same book. Still have mixed feelings about it! I'm going to use the practice of gleaning (extracting small pieces of useful information from everywhere) and taking the best of what I'm reading and letting the rest go. I know I wrote before about eliminating dairy from my diet. I've been eating cheese like it's my job this week and I wonder if that's a factor in my feeling crummy this week. I've decided that July 4th will be my last dairy day since February 4th was my last meat day. The only dairy thing I think I'll miss is pizza (although I know it's still good cheese less!) so tomorrow night Carly and I are going out for one last cheesy pizza. I'm looking forward to making this next shift to see how it makes me feel. Here's the resolution to your cheese issue. Next time you are in town, pick up some Daiya Cheese. It's not a direct comparison IMHO, but sprinkle a bit on and plenty of veggies and you will get your cheese fix. If you have a Z Pizza near you, they sell pizza with the Daiya cheese and I was lucky enough to get a sample of it. It runs about $5 a bag, so if you can sample it, all the better.